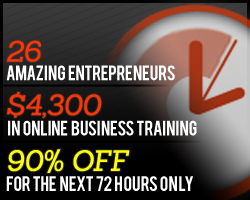 For the next 3 days, the BIG Only72 entrepreneurship education sale is on. This sale ends on Thursday, December 1 at Noon Eastern. Well over 1,000 people picked up last year’s package. If you’ve thought about buying any sort of business education, this is the perfect time to do it. This time, I’ve put together something special for this sale. We created a new “Lite” version of our popular Traffic School course just to add to the package. Traffic School is normally available only twice a year, and it has sold out within 2-3 days every time we’ve opened enrollment. You’ll get instant access to Traffic School Lite as part of this sale AND you’ll get 23 other guides and courses all at 90% savings. Plus, if you buy the “amplifier” package through my links on this page, I’ll also give you a free 30-minute one-on-one business strategy session where we can talk about your blog, your business, your ideas or anything else you like. Just email me when you’re ready and we’ll schedule the call. This sale will also be raising money for a good cause again. Only72 has partnered with Women of the Americas Sustainability Initiative who train international women community leaders on how to build sustainable housing and buildings. These clay and earth techniques are then used to build schools, low-income housing, and other vital community building in nations across the world. $5 from each “launcher” package and $25 from each “amplifier” package will go to help WASI train dozens of more women leaders from all over the planet. This is a “for profit” sale, but Only72 has raised over $40,000 for charity in the past year. Note that the links above are affiliate links, so I’ll earn a little beer money if you purchase. Thanks as always for the support. And remember, if you buy the “amplifier” package through me, you’ll get a free 30-minute one-on-one strategy session with me (just email when you’re ready to set it up).